Charlie Collins [far right in inset] is living proof that there was a time when there was truth in the promises that evolved out of those stories by Horatio Alger, Jr., tales that promoted the idea that hard work, honesty and dedication could earn anyone a version of "The American Dream," which society has come to define, at the very least, as the picket-fence fantasy of homeownership. At the age of 18, Charlie arrived in Los Angeles fresh from working the family farm in Texas, looking to start life on his own. He casted about town for a job and ended up at a Westside diner where they baked pies each morning, grilled burgers all day, and served Coke, Nehi Orange and Nehi Grape in paper cone cups. He planned only to stay a few months, then find something else, but when he looked to leave, his boss made a sweeter deal of staying put. That was 1957 — 50 years ago — and Charlie Collins never left the diner he wandered into one January day. Now 68 with no plans to retire from the restaurant, Charlie lives an enviable life as the owner of a three-unit apartment building in Venice, as well as a home in Inglewood, properties he bought in 1965 and 1978 respectively. He’s the father of two adult sons, both college graduates, one of whom teaches grade school and the other of whom works for Los Angeles County. Charlie is also a grandfather, twice. He lost his wife, Mary, of 38 years in 1998, and says his job has become his devotion. Charlie is the general manager of The Apple Pan on Pico Boulevard east of Westwood Boulevard, an institution that will celebrate its 60th anniversary in a little more than three months — the menu is dated April 11, 1947. Charlie does not drop the names of famous patrons by habit, although when asked to do so he can compile a list that includes such Hollywood royalty as the late actor/comedian Rodney Dangerfield and performer Sammy Davis, Jr. (Davis used to like for Charlie to step out from behind the grill and talk to him.) “I think he wanted people to recognize him,” Charlie said. Film Critic Joel Siegel still stops in to say hello. (Siegel put Charlie on national television during the 1984 Olympics in Los Angeles.) Director Rob Reiner took a seat at one of the counter stools recently, Charlie said. Outside the walls of The Apple Pan, American service jobs like Charlie’s have changed dramatically since he stacked his first Steak Burger with a hunk of iceberg lettuce and a slice of Tillamook cheddar. The average diner worker in the 21st Century can't hope to achieve what Charlie did on his salary, especially in Los Angeles. With the median housing price in the Greater LA region set at more than $590,000 [see Nov. '06 figures], an annual income of more than $127,000 a year is necessary just to qualify for a 30-year-fixed mortgage on a median-priced home [see PDF from State Division of Housing Policy Development]. There are lawyers in Los Angeles who don't make $127,000 a year. Charlie praises The Apple Pan's founder, the late Alan Baker, for holding fast to his business philosophy, “Quality Forever,” which is explained in the menu as being possible only if the restaurant succeeds in winning customer approval and repeated patronage. It's a recipe, Charlie said, that continues to be followed by Baker’s family. Many of the houses in the neighborhood have been replaced by McMansions. The Westside Pavillion mall across Pico has been built and rebuilt. And a flock of wild parrots has moved into the trees down the street. But inside The Apple Pan, just about the only significant change in 50 years is the selection of sodas. 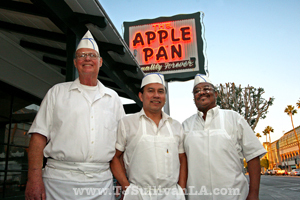 It's clear to anyone familiar with Los Angeles eateries that The Apple Pan is more than a place to eat, having earned a distinction on par with The Original Pantry in downtown LA. Theirs is a club with few members. “People have been coming in the past 25 years to write about it,” said Charlie. And that doesn’t seem like it’s about to change either.